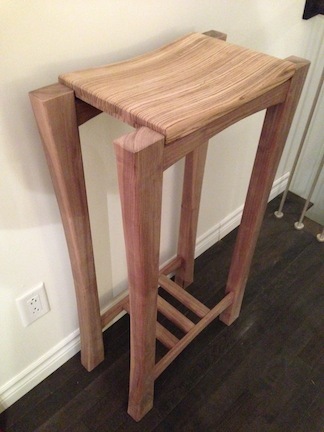 Greatest challenge: The stool was designed on the fly so getting a couple of the measurements right was a challenge. to get rid of some scraps including my zebrawood which was bought for another project but changed my mind so I had this nice piece of wood that I really wanted to use. to include a curved seat to try my newly bought rasps and add a few curves in the project. to see the end grain on the walnut. My initial idea was to make trough tenons but after making the curves on the legs, I quickly realized that it could be difficult and time-consuming. I came up with this design on the fly and this is the project I had the most fun building in a very long time. I used my newly bought Domino joiner in a couple of places and it was a great project to try it on. Recommendation for next build off: Anything that can be built in a day or two which can also be useful. This is very beautiful. I love the flow of the seat and legs. It works well. Nice legs! Very graceful waterfall curves.